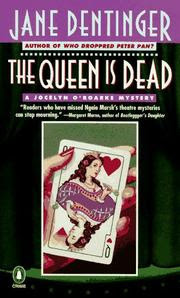 When my friend Jon and I were discussing "The Winter's Tale," a production of the Illinois Shakespeare Festival that I had just seen, he mentioned "The Queen Is Dead," a mystery novel by Jane Dentinger that deals with her heroine/sleuth, an actress named Jocelyn (AKA Josh) O'Roarke, returning to her college campus to play the role of Hermione. O'Roarke fills the role as a favor after her mentor, an amazing actress and teacher who was set to play Hermione, dies unexpectedly. Everybody thinks it was a heart attack, but Josh is suspicious. So now Josh has to negotiate her way through the intricacies of a possible murder investigation, along with academic in-fighting, a flood of old memories of her own days on campus, strange currents among her colleagues and friends, and still somehow take on the tricky role of the ill-used wife and mother in "The Winter's Tale." I thought I'd read all of Dentinger's backstage mysteries (mystery + theater = perfect for me), but this one didn't ring any bells. So I quickly purchased a copy and read it, mostly as a way to see how Shakespeare's "Winter's Tale" fits into a mystery. The good news is that Dentinger does indeed use "The Winter's Tale" and its plot to inform her own. There are crucial clues in the play (that I'm guessing most readers will figure out long before Josh O'Roarke and her hot policeman pal, Gerrard, do in the book) as well as some fun information about how O'Roarke intends to play the role and how the pieces come together on stage. So far, so good. But the bad news is that I found this the least interesting of Dentinger's mysteries just as a mystery, with O'Roarke herself coming off much less appealing than in the other books. I admit I loved "Who Dropped Peter Pan?" as much for its method of murder (i.e., somebody arranging to drop an actor who is flying through the rafters as Peter Pan) as its send-up of a vain star/producer who never should've been playing Peter Pan in the first place. But in that one, I don't recall ever finding myself annoyed with Josh as a character. In this one, on the other hand... When she and her old roommate, Francis Mary Findley, get together, what seemed like cheeky irreverence and zippy slang before suddenly feels forced and way overdone. I'm afraid that continues throughout the book, and while Dentinger clearly intends for me to think her heroine is perfect and charming and wonderful and the Best Actress Ever as well as the Best Friend Ever and the Smartest Girl Ever, well, I just wanted to punch her and tell her to get over herself. That's not a healthy relationship between Heroine and Reader. Still, the view of what goes on behind the scenes, from how to move your fall to upstage a hammy scene partner to how a costumer might take revenge on an actress he doesn't like, is quite amusing. The murder weapon is also creative, and again, I liked how she used the issues in "The Winter's Tale" (not even the obvious ones) to sculpt her plot. When it comes to learning more about "The Winter's Tale" in a painless, pop fic way, "The Queen Is Dead" serves nicely. So glad you searched it out and read it, Julie! I agree with your appreciation of how closely "A Winter's Tale" ties into the story -- especially all the nitty-gritty details of acting choices, and costuming tips, and stage falls and all that. My memory, though (and I know I'm running the risk of being That Guy again, remembering too much) is that you had pretty much that same reaction to our heroine Josh in most of the books -- resisting the author's depiction of her as adorable and admirable. The funny thing is, it pretty much worked for me! I like Josh a lot in all the books (except when her Irish temper gets the better of her, but I don't think we're supposed to be altogether on her side at such moments), and enjoy her company. I wish the series hadn't stopped. I knew that was a possibility, but I didn't really remember disliking her THAT much. I did seek out the other books, after all. Although perhaps not all the other books, since this one seemed completely new to me. If you think I read it and discussed it before and I've completely forgotten it entirely, it's probably best not to tell me! No, my recollection is (though I could always be wrong!) you tired of the series after a few books (or maybe just had a life, and were busy with other things) and missed this one. I ventured to suggest you might like "Who Dropped Peter Pan?" (not knowing at the time that it would turn out to be the last) because of the gossipy roman a clef aspects, even though I had the impression you had grown weary of the detective. One thing I do love about this series is the genuine nuggets of actor insights. Like how all the characters in "Major Barbara" who appear only in the Salvation Army scene can be doubled with the principal characters in the other acts. Or the routine of shooting a tvmovie with an ingenue whose talent is more instinctive than trained, and who needs to be revved up before each scene. I'm sure your recollection is right. And I agree -- the actor insights are the best part. Although Dentinger does show a nifty ability to devise odd ways to kill people.